On the 13th day before Christmas Santa gave to me 5 Avengers Christmas Banners, so you can vote on which of these five entries will become this forums temporarily banner during Christmas and New Year. First of all a word of thanks to the users who contributed by making a banner. They are all lovely and it will be hard to choose, but only one can win. The winning banner will be displayed from the 20th of December until the 4th of January. In case of a tie in the voting the Ministry will decide on a solution. But the more of you vote the less chance there is of a tie, and yes you may take that as a hint. Posting is allowed in this forum but please do not speculate on who made a banner, and most important: If you can't say something nice say nothing at all. Have a good look at all five before you cast your vote. This poll will close at 4:00 p.m. British time on December the 19th make sure you vote in time! Boy this was a tough choice! It came pretty close to me just closing my eyes and clicking, because I had a heck of a time picking just one. Four good ones and one ever-so-slightly better. And the spread of votes seems to confirm that. I wouldn't be against any of them appearing, they each have an aspect that I like but I'll wait until closing to vote. Ouch, tricky, they are all great! I fear that one with my beloved Cathy but no Mrs Peel will suffer unfairly in the voting - people do love their Peel. 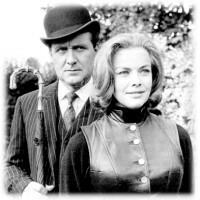 I can't really sanction a banner without Steed, however glorious; Steed *is* The Avengers. Can we have all of 'em? Even though they are all great entries, one particularly caught my eye and so for me it was an easy choice. Well done to everyone, by the way. Oh, they're all very good! I wish I could have entered this year, but I'm so insanely busy, I have trouble even getting onto the forum on a regular basis. But there are great choices there, and it was a hard one to vote on. All the same, I've made my choice. Love your signature banner, btw, Darren. It would have been a fine entry for the contest in itself. I thought Darren's sig could have been entered as well, but the addition of the required text would have ruined the look of it. So too with Dandy's new sig - looks like a repeating background, HTML sig??? Funny you should say that - I did enter another version of it but it obviously wasn't received. But hey ho. I had the privilege of winning last year so can't complain. I still can't quite decide on my final choice. Oh, well. We got to see this one anyway. 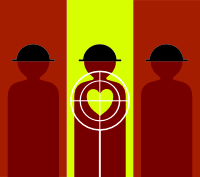 I adapted it from one of those 'foto fun' sites you can find online (as was my avatar). I admire all of those that create those banners from scratch. I wouldn't have the patience, which is why I never enter. They're all nice, but there's one that stands out as the best design for me. The forum will look good with anyone of them as Christmas banner, though. Stupid me, I got the time difference wrong and failed to vote in time... just as well really, I would have done the wrong thing and voted for my own. Dissolute is the winner of the 2010 CBC. Congratulations to him and also a thank you to ISCHTAR who was the only one who gave him competition and also the creator of my personal favourite banner 2. Banner 2 got my vote as well. Thanks Allard! Strangely, I thought my green banner was the better of my designs, but the gold is more festive. 3 and 5 were my favourites from the start, but 3 was just so different and charming that the choice was actually quite easy to make. Uncluttered, stylish and fun. Congratulations, Dissolute.